As the song goes, breaking up is so very hard to do. Divorce can be financially and emotionally devastating, but it is not the only option when a marriage flounders. Whether you believe you might save your marriage or your marriage is broken beyond repair, there are alternatives to divorce. To save a marriage, you can try counseling or mediation. To avoid a divorce but go your separate ways, you can opt for a trial separation, legal separation or a "non-divorce," sometimes known as a parallel marriage. A non-divorce describes a relationship between married people who decide to continue the marriage while living as passionless roommates. As "Smart Money" magazine states, "While there are no hard statistics, some divorce experts say they're seeing more of this unromantic phenomenon, driven by three big financial factors." The expense of a divorce, cost of creating two separate residences and possibility of one spouse losing health insurance coverage all mitigate against divorce. Some couples write up an informal "marriage continuation" plan to specify their living arrangement, which can take the form of agreeing to live in separate areas of the house. A trial separation allows a couple to live apart while pondering the question of divorce. A couple may consider a trial separation of six months, long enough to get used to living separately. There are advantages and disadvantages to a trial separation, according to experts. The main benefit is that a trial separation can continue for as long as you want. The main disadvantage is that it leaves your marriage in a state of limbo. You should negotiate subjects, such as the use of bank accounts and credits cards, whether you will date others and how often you will re-evaluate the relationship. A legal separation is a more formal option. You must file papers with a court that contain the terms of the separation. If you have children, agreements concerning custody and child support payments are paramount. Legal separation can work well for couples who have financial or moral reasons to avoid divorce, even though their relationship as spouses is at an end. For example, your religious beliefs may prohibit divorce or your insurance coverage may end if you divorce your spouse. 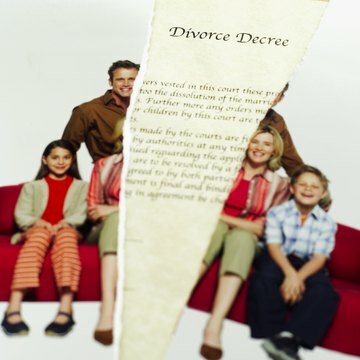 In essence, a legal separation has all the elements of a divorce without the actual decree. The length of legal separations are determined by state law. For example, Indiana limits legal separations to one year. In Washington state, you can remain legally separated for an indefinite period of time. If you are trying to save your marriage, some form of counseling might help you mend the rift. It is important not to wait too long to seek help, or give up before counseling has a chance to work. Another possibility is marital mediation, using a professional mediator to assist the couple in resolving their own disputes. Mediation is particularly helpful when the husband and wife disagree about such issues as parenting, household chores and relationships with family or friends. Mediation often helps repair the couple's ability to communicate with each other. Once you have made the decision to divorce your spouse, it's not unusual to want the process to end as soon as possible. Although it may be a challenge, getting a fast divorce in Louisiana is not impossible. The best way to do so is by filing for a no-fault divorce and working with your spouse to create a marital settlement agreement, in which all marital issues are resolved, such as division of property, child support and custody, and alimony. By doing so, you reduce the likelihood of delay and may get your divorce decree faster. Is There Such Thing As a Legal Separation in Pennsylvania? Legal separation isn’t available in Pennsylvania. If you are no longer living as a married couple, divorce is the only option if you want the state to recognize your separate status legally. However, until you file, you can take certain steps to ensure that your separation is well-established. First, you must stop living as a couple, starting with not sharing a marital bed. Second, other people need to know that your marriage is over. If you keep your separation a secret, your separation may come into question. Can Two People Live Together During a Divorce?